This rosy-magenta jacket is 65% wool and 35% silk and was made in Hong Kong by Anne Klein II. There is a nice sheen to it. It has a black lining and a 15" long left front side zipper which starts 4 1/4" up from the bottom hem. It has an interior front bottom clear button. 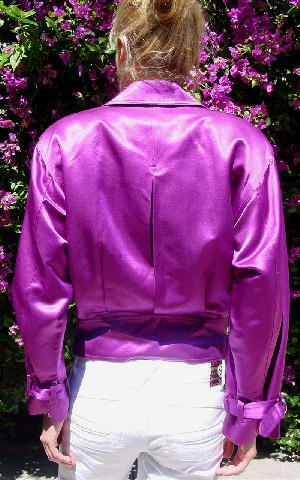 You can wear the jacket unzipped and belted at the bottom with wide lapels (7" across the top) or zipped with no lapels. There are 2 vertical slash pockets in the front. The back doesn't have a belt. The 1 5/8" double sided fabric belt is attached at the side seams and you can see it for 8" and then it is hidden (for the 5 1/2" to the front end side) and then extends outward 4". The left side extends 7" and has a double pull-through silver-tone buckle. There are shoulder pads and the long sleeves have a 1 1/4" wide mini belt (and loops) to match the look of the front belt. The back has a center 11" open inverted vent pleat and 4 small pleats extending upward from the waistband for movement (and detail). The tag says size Small, but it also fits a size Medium. ahoulder to shoulder 19 1/4"
shoulder pad to shoulder pad 20 1/4"